How can I explain how pleased we were to be back at the coast? By submitting the photographic evidence! The minute we arrived back at the coast Ben and Catherine, who are exceptionally good at arguing when they want to, started interacting on an entirely friendly basis. Wow! As I watched this rare moment of harmony a small judder of sheer pleasure passed through my body. It shot up into the clear blue sky like a firework as my two children engaged in happy discourse. 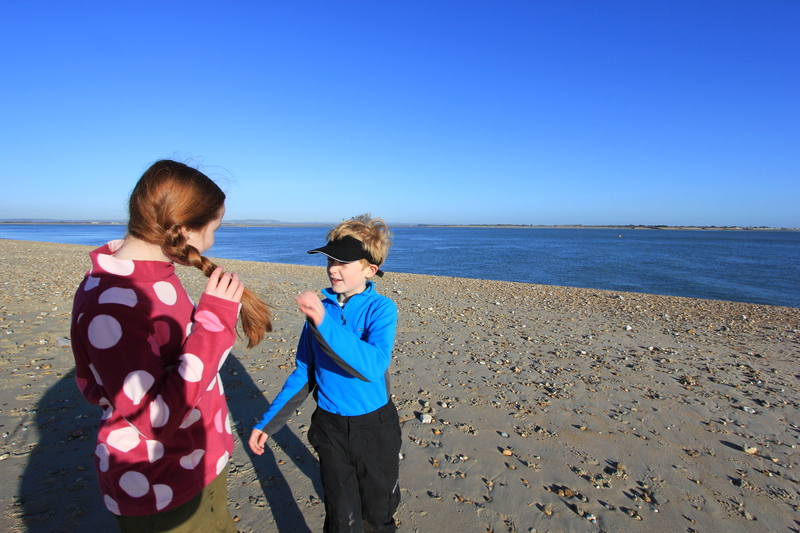 We quickly reached the groynes that lined the southern shores. Their bases were piled high with mini mountains of riprap. 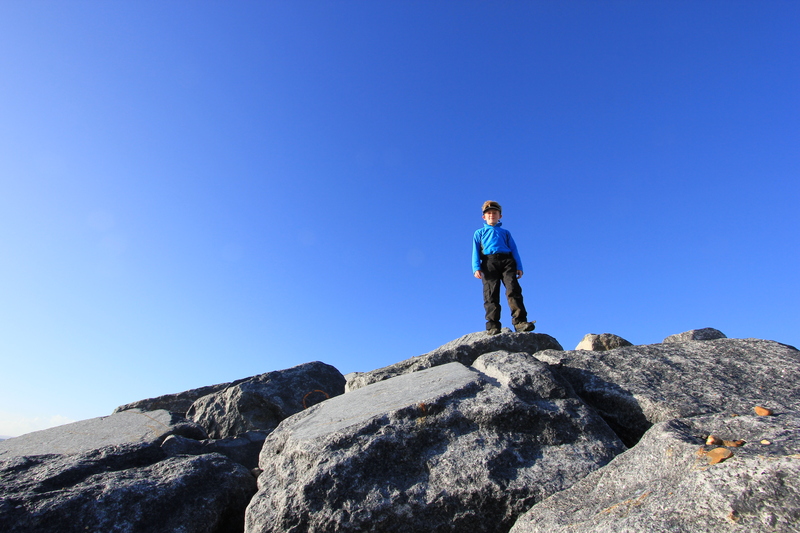 Instead of trudging around saltings and mudflats we were able to climb these massive boulders to reach giddy heights of celebration as we surveyed our beloved coastal landscape that spread itself out below us. Whilst Ben and I scaled the island’s rocky heights, Deb and Catherine caught up on some valuable girl-time. 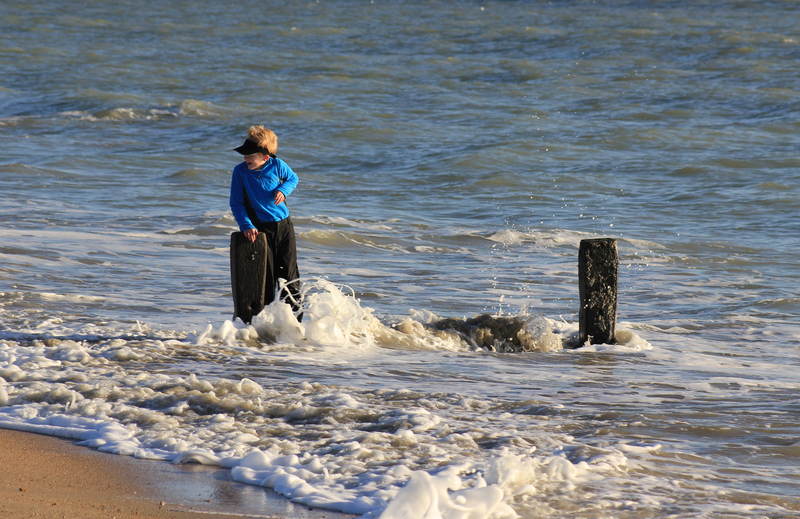 Soon enough the incoming tide started lapping the outlying timbers of the groynes. This, to my son, was like dumping a rancid corpse in front of a fly. He couldn’t keep away, and charged out to do battle with the waves. Fighting the world’s oceans is the only game I know my son to play where his overriding objective is to quickly succumb to a resounding defeat. He bathed in his defeat. Literally. Yes, I think we all agreed that it was good to be back at the coast. 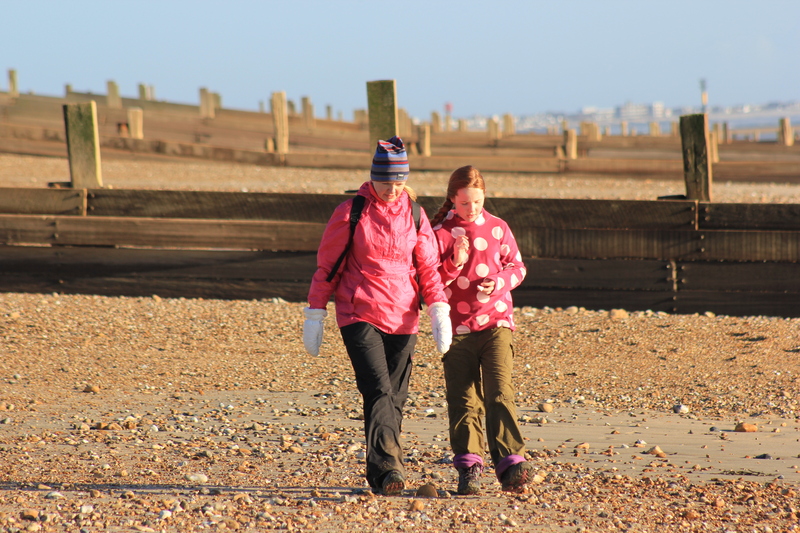 This entry was posted in Hampshire, Islands and tagged beach, coast, groynes, Hampshire, Hayling Island, riprap, sea, travel, walking. Bookmark the permalink. It must have been those negative ions! Thank for the re-blog, Jody! Where you were the water was rock solid, wasn’t it?!? Lake Erie isn’t frozen completely over yet, but I think it will be soon!